If you're obsessed with relaxed dressing when it comes to fashion, you'll love this totally chic pairing of an olive cape coat and a FINE JEWELRY gold plated diamond accent crisscross cuff bracelet. And it's a wonder what a pair of black leather over the knee boots can do for the look. If you're all about practicality dressing when it comes to fashion, you'll love this chic pairing of a black coat and a FINE JEWELRY gold plated diamond accent crisscross cuff bracelet from jcpenney. To add oomph to your ensemble, complete with black leather ankle boots. If you're a fan of relaxed dressing when it comes to fashion, you'll love this totally chic pairing of a white and black polka dot sheath dress and a FINE JEWELRY gold plated diamond accent crisscross cuff bracelet from jcpenney. Elevate this look with hot pink suede pumps. Consider wearing a white sheath dress and a gold bracelet for a relaxed take on day-to-day wear. Marry an orange leather bodycon dress with a gold bracelet to be both casual and knockout. As for the shoes, go down the classic route with beige leather heeled sandals. If you're obsessed with relaxed dressing when it comes to your personal style, you'll love this totally chic pairing of a black lace kimono and a FINE JEWELRY gold plated diamond accent crisscross cuff bracelet. Make a grey crew-neck t-shirt and a FINE JEWELRY gold plated diamond accent crisscross cuff bracelet your outfit choice for a relaxed take on day-to-day wear. And if you want to instantly kick up the style of your look with one piece, enter burgundy leather heeled sandals into the equation. 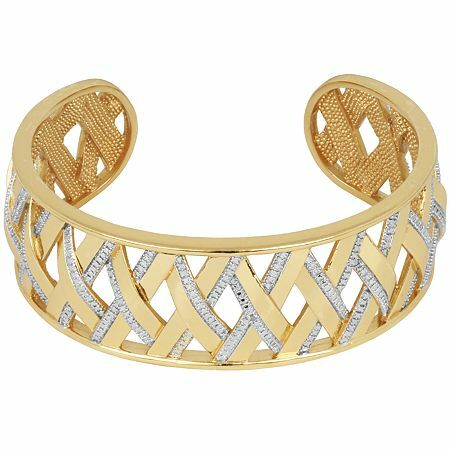 If you're all about relaxed dressing when it comes to your personal style, you'll love this extra adorable combo of a white cropped top and a FINE JEWELRY gold plated diamond accent crisscross cuff bracelet. Rock a pair of tan leather heeled sandals to kick things up to the next level. Dress in a red vertical striped cropped top and a FINE JEWELRY gold plated diamond accent crisscross cuff bracelet from jcpenney, if you want to dress for comfort without looking like a slob. Throw in a pair of grey leather heeled sandals to instantly up the chic factor of any outfit.